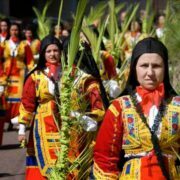 The Holy Week in Sardinia is a unique and exciting event, in which pagan rites meet Christian beliefs to create captivating rituals, remarkable processions and fascinating moments.The passion of Christ blends so intimately with the cycles of peasants’ life, so dear to the Sardinian people. The processions of the Mysteries, the touching rites of the Descent from the Cross and the meeting between the statue of Jesus and Mary are crucial moments of the festival. An important role is also played by the Brotherhoods, who parade in their striking costumes, singing religious songs in Latin and Sardinian, whose origins date back to the Middle Ages. With such rich traditions it is not surprising that in Sardinia Easter is called Pasca Manna, meaning Big Easter, to differentiate it from Paschixedda (Little Easter), which stands for Christmas.